Gonyosoma oxycephalum is a beautiful non-venomous diurnal and arboreal colubrid. 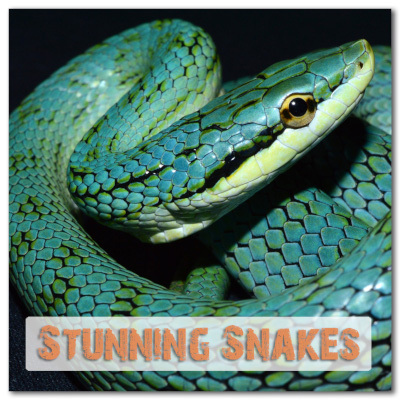 It is a robust snake with powerful, smooth scales on its belly that is ideal for climbing trees and across branches. It has smaller, smooth scales on its back that is usually bright green or light green and may have black net-like pattern. There are different colours, depending on the locality: green, silver, orange. Babies can be kept in small faunabox and when they will grow to yearlings, they can be moved in terrarium. We keep adults in big terrariums at size of 1.8 x 0.7 x 1.5 meters (6 x 2.3 x 5 feet) but ideally if you had the space, you can use a larger terrarium. Since they’re big and arboreal, they need branches and trunks to climb and stay, and foliage (fake or real plants) to feel more protected. The ideal is to provide them a dry hide and a moist hide at the bottom of the terrarium and one at the top. Gonyosoma oxycephalum is a species who often make foul-smelling defecation, so you need to use a substrate (dusted wood chips or cocopeat) that can contain the smell and help you to keep them clean. We have never used artificial lighting for our Gonyosoma oxycephalum because our snake room has a window, so they can perceive day and night during all the year and have their photo-period. This is very important for their breeding. If you don’t have a window in your room, it’s recommended to use UV lighting to emulate the day / night photo-period and to create normal daytime according to the season. Like most snakes, a thermal gradient is essential for them. They must have the possibility to thermo-regulate themselves. They don’t like high temperatures. You can keep them between 25-29 °C (77-85 °F) and a little less during the night. They always need a water bowl in their terrarium, big enough to let them to stay in the water; they will appreciate this. The water must be changed often. Some specimens (specially WC ones) could need to drink from the foliage or from a nebulizer. Gonyosoma oxycephalum need a medium-high level of humidity in their terrarium, 80% could be good. You can spray water in the terrarium with a nebulizer if the humidity is too low, this will also mimic the rainy season. Pay attention, humid does not mean excessive condensation: too moisture could grow mold in the enclosure. 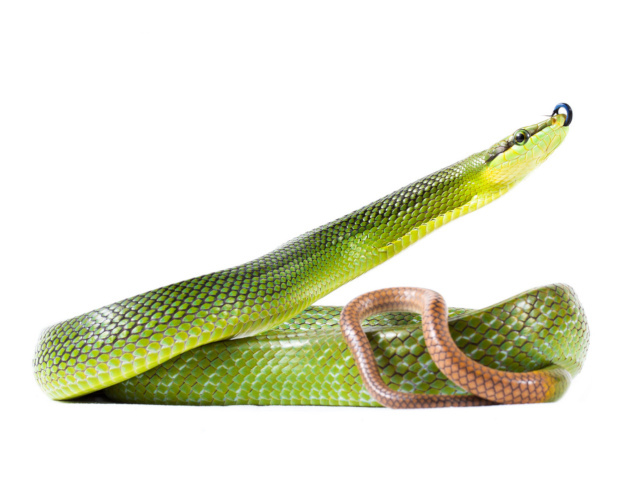 Gonyosoma oxycephalum eat mice, rats and chicks but they definitely prefer chicks or other birds. Before the breeding we prefer to give them only chicks in order to have a softer egg shell, because mice and rats have more calcium. We feed our juveniles every 5/6 days, our yearlings every 7/8 days and our adults every 12/15 days. We don’t like to handle our snakes because this can cause stress for them. When we have to clean, we close them in their hides or we take them slowly and without sudden movements, to avoid frightening them. This species have a high metabolism, and after feeding they poop several times. We remove the dirty substrate every time they poop, and we deep clean them once every month or so. A clean terrarium is essential for them, like all other snakes. They shed quite easily if you provide them an moist hide and spray on them during the shedding period. We suggest to inspect them (mainly eyes, tail and cloaca) after every shed. CB specimens don’t have health problems if they are kept correctly. You must take precautions during summer to avoid too high temperatures, because they could suffer an excessive heat. Pay attention also to the humidity level (the condensation must not stagnate in the terrarium) because it could cause skin and lung infections.